A truly unique and all-inclusive Florida Beach Wedding Ceremony! Having your Florida beach wedding ceremony with us is the best choice you can make. Take advantage of our years of experience and knowledge to ensure that you have the best beach wedding possible. Our decor is created by our team of designers and we strive to make sure they are unique and elegant. Choosing one of our beach weddings for your Florida beach wedding ceremony will ensure that you have the best decor possible. Our Anchors Away Distinctive Design Package is truly unique with its black bamboo. The black bamboo canopy and aisle-way stand out on the beach and add style to your wedding that most other companies can’t offer. If you are looking for a Florida beach wedding ceremony that will stand out, this is the right choice for you. 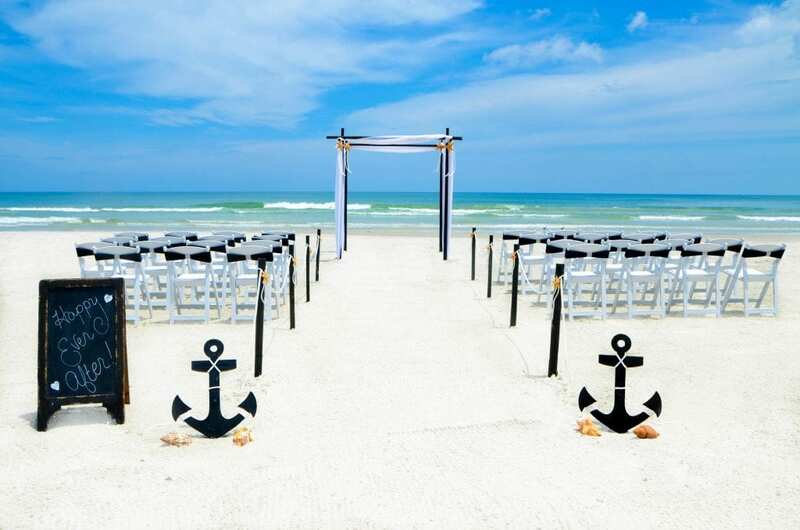 Our Anchors Away Distinctive Design also includes an upgraded sand ceremony vase, a gift for the bride and groom, and a water and lemonade station for your guests to enjoy out on the beach! The included chalkboard sign will also let your guests know that they are at the right location and is great prop for photos! We highly recommend adding the additional photography time to truly show off this beautiful beach wedding decor back home to your friends and family. By adding the additional photography time for your Florida beach wedding ceremony with us, you will get photos with your guests, bridal party and posed photos of you and your other half down by the water.